Right now I have two 100w panels that give about 119w. So I'm getting about half bc of losses. If I wanted to get 1,000w of power does that mean I'll need 2,000 watts of panels? For example, seven 300w panels to get 2,100w which will actually give me 1,050w. I'm looking for an off grid set up. I am a little confused about your 119 W. Is that the highest number you see on any given day? Full Sun? Solar Noon? Surely you don't mean Watt hours per day. I have 9 285W Solar panels and see on average about 1900 watts if the sun is out around peak times consistently. I can produce up to 10.5 kWh per day in N FL with about 4.3 sun hours average per day. In the spring before the summer heat really heats up the panels I have see them occasionally hit just under 2300 Watts. Not bad for a 2565 Watt array. But I know panels lose some rated power over the years. As always, details matter... Temperature and aiming of panels at sun (Cosine error), atmospheric clarity/humidity/etc., temperature of cells, charge controller type and what charge mode it was in (bulk, absorb, etc. ), battery bank state of charge/bus voltage, specifications of panels, etc. The typical best case noontime harvest (all things being taken into account towards "best harvest") is around 75% to 77% of "rated wattage" for panels. You won't hit this value every day--But is a good maximum that most people will see once in a while. If your using a PWM controller and the panels are Vmp~18 volts in parallel, and the battery bank is ~80% or less state of charge (and the charge controller is in "bulk"), you should see pretty close to Imp-array going into the battery bank. Seeing 50% of rated output from the array is a bit on the low side, but it is hard to say if something is bad or misprogrammed (like the charge controller) or you could have wiring issues (lose, dirty, corroded, to small of AWG, to long of wire run, etc.). 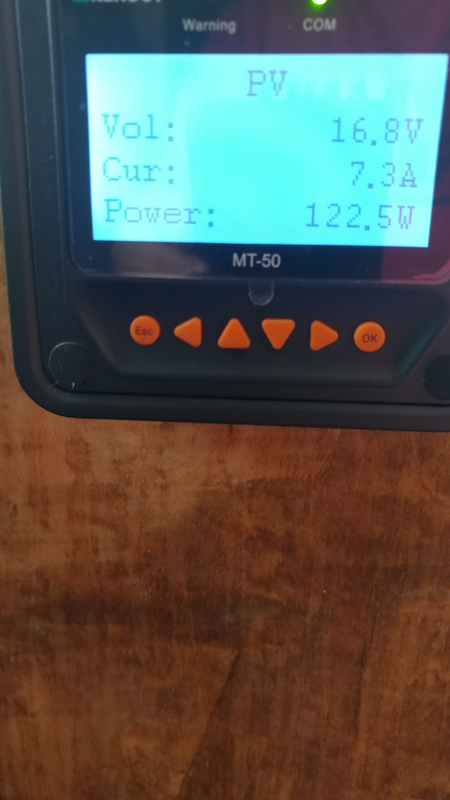 Using a voltmeter, you can check the voltage at the solar panels, Vpanel input of the charge controller, Vbatt output of charge controller, and Vbatt-bus connection. Between Vbatt-controller and Vbatt-bus, you should see a maximum of (ideally) 0.05 to 0.10 volt drop from controller to battery bank with near rated current flow. Too much voltage drop, and the controller may go into absorb charge (constant voltage like 14.75 volts) and reduce charging current early. Vpanel for a PWM controller should be near to Vbatt (maybe Vbatt +1-2 volts). And using a DC Current Clamp DMM, you can measure the current of each solar panel (if in parallel), to see if their output current is closely matching (mismatched current flow, could be a failing panel). If you do not have a current meter, you can connect only one solar panel at a time to see that they both have similar current output. Generally, you can expect about 70% of nameplate, for well aimed panels in sunny exposure. As aim declines, so does harvest. In Myrtle beach sc 2 100 watt panels clear day yesterday on a very low battery 75°f at 11 am was 163 watts 12.4 amps 13.2 volts mppt. Are the panels tilted to the correct angle or, possibly lying flat level? I have 2 100w panels and this is the highest I've seen them go. That's why I'm saying if I want 1,000w should I get 2,000w worth of panels. Short answer no. Unless panels are mounted flat or you have shading issues. Or using pwm in extreme heat!! IMHO Expect 75~80% of rating. Are your panels in parrelell on mppt? If so try putting them in series. +1 on putting them in series (assuming mppt controller... if pwm I think voltage would be near Vbatt?). At 16.8v mppt may be having trouble getting a good max power point.